Unless you’re a keen observer of the different styles of engagement rings available, it’s unlikely you’ll realize just how many types of settings are available. Read our complete guide of engagement ring setting styles. From the commonly seen settings to those which only make an occasional appearance, there are probably more than you know. The great thing about modern engagement ring design is that convention isn’t quite the golden rule it once was. Designers and manufacturers keep coming up with ever-more creative ways to show a diamond at its best. The prong setting has been the most popular setting for as long as diamond engagement rings have been around. 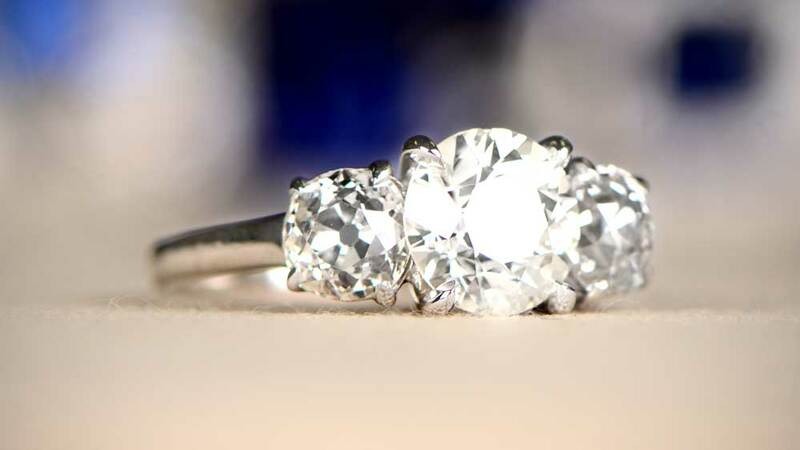 Depending on the size of the diamond, there can be 3, 4, 6 or even 8 prongs keeping it secure. The actual ring style might also dictate how many prongs there are. One reason the prong setting is so popular is that its specific intention is to show as much of the diamond as possible. The very open nature of the setting allows this perfectly. The diamond is also higher than in any other type of setting. This can lead to it looking bigger than the carat weight would suggest. This approach means more light in, and more light out. Given that this is one of the major attractions of a diamond engagement ring, and it’s no wonder prong settings are still so popular. A prong setting is also reasonably easy to clean, although care is needed not to damage the prongs. But there is another side to a prong setting. Prongs are, by definition, a snag waiting to happen. At best, this can pluck clothing. At worst it can open the prongs wide enough to let the diamond pop right out. Also, the ratio of the diamond exposed to potential impact damage is significant. Diamond may be the hardest mineral we know, but it is actually quite fragile. Hit it hard enough, and in the right place, and there’s a risk you’ll take a chunk out of it. Despite all that, though, there’s no doubting the prong setting credentials as a classic, almost eternal setting for an engagement ring. Not technically a separate setting in itself, but worthy of mention here. Nowadays, lost of jewelers advertise rings with a 6 prong setting. Until a few years ago, they would advertise this as a Tiffany setting, until Tiffany & Co took one seller to court for trademark infringement and won. The point of the original Tiffany setting was to offer extra security to the diamond in a solitaire ring. A solitaire ring is a ring with a single diamond. Actually, it doesn’t really need to be a diamond, but it is the most common engagement ring stone and so the association has stuck. The position of the prongs in a Tiffany setting is also very precise. Two are against the edge of the band on either side of the diamond, with the remaining two exactly halfway along the edge of the diamond. 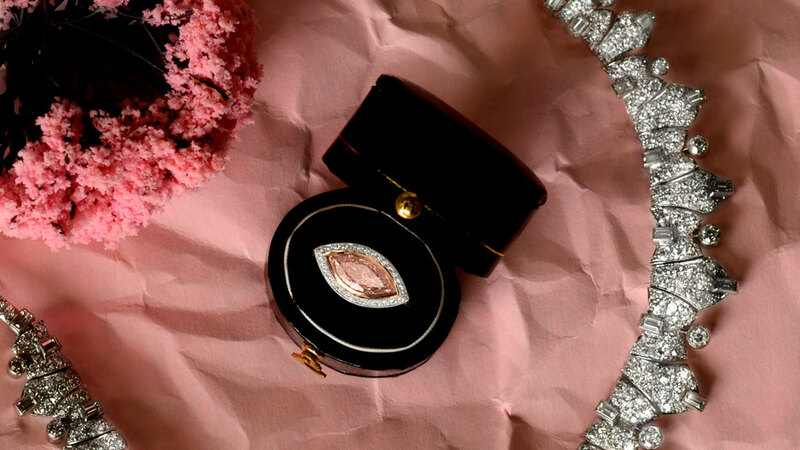 The increase in the security of the diamond is considerable and, in a time when far more women work than would have been the case a hundred years ago, it’s a good choice. Closely following the prong setting in terms of popularity is the bezel setting. Taking an entirely different approach, the bezel setting is in the form of a complete ring of metal around the center diamond. The look is very stylish and offers a far more secure alternative to the prong setting. For those with an active lifestyle or job which involves lots of “getting stuck in”, it’s the ideal choice. The bezel setting has been around for far longer than prongs. In fact, it has seen widespread use since ancient times. The stone is set low down, with the metal ring custom sized to keep the diamond entirely secure. The slight downside to this is that less of the diamond is visible, and so there is a slight reduction in light reflection. It is, though, extremely easy to clean. If the thought of hiding a big part of your diamond doesn’t really appeal, the partial-bezel is also an option. This is where the corners have a section of bezel but the sides remain open. It offers a bit more visual appeal and does help to improve the light reflecting properties. A halo setting is really an extension of a plain bezel setting. The difference is that there is also a halo of secondary stones around the center diamond. Often, but not always, these stones would be in a contrast color. 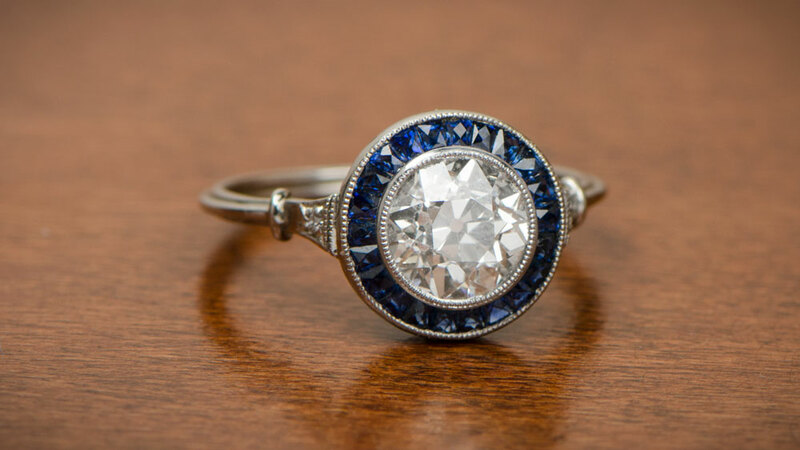 Sapphires are especially popular as halo stones, but there is no rule as to what type of stone a halo setting should have. 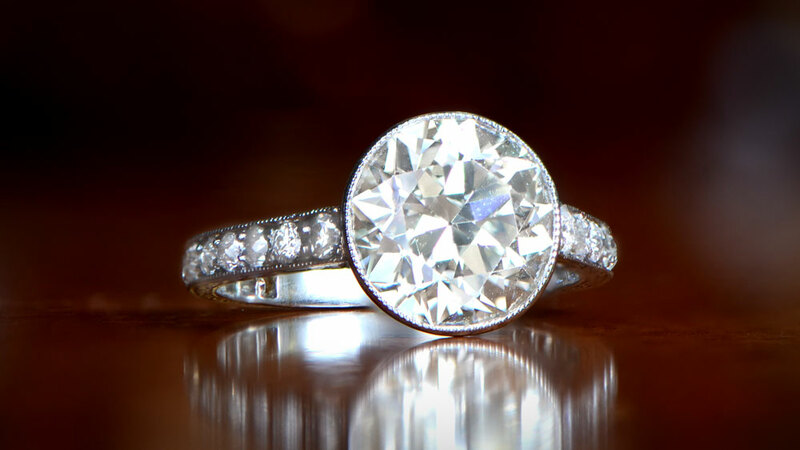 There most popular halo is the diamond halo. Apart from offering the same benefits of security that the bezel setting brings, there are other benefits with a halo setting. Aside from the obvious visual interest of more stones, it means you can have a smaller center diamond. The halo makes lower carat diamonds look a little bigger than they actually are. A halo setting does have some limitations, though. Resizing can be difficult due to the risk of the halo stones becoming loose or even popping out altogether. The halo stones also may not be quite as secure as the center stone. Overall, a halo setting is a very beautiful way to wear an engagement ring. Slightly different from other more commonly used settings, a pavé setting involves the shank of the ring, rather than the center stone. Literally from the French word for “pavement”, pavé stones are usually small and set down each side of the band from the top of the band downwards. Some pavé may go all the way around the band, others may go only halfway. Usually, the smaller stones would be diamonds but, again, the rules on such things are quite loose. In fact, to qualify as pavé, the stones should be less than 0.02ct each. Less than 0.01ct would then be micro-pavé. The actual setting of the pavé stones is actually quite unusual. Holes to the exact size of each small stone are first drilled in the band. The stones are held in place with micro-beads similar to milgrain to act as pseudo-prongs. If the holes are not the right size, or the beads aren’t in the right place, the pavé stones can easily work their way out. Any ring can have a pavé setting, as it is entirely independent of the center stone or any other adornments. Like the halo, though, resizing an existing pavé setting can be difficult. The three stone setting got a huge boost in popularity when Prince Harry proposed to Meghan Markle using a ring with this setting. The idea of three diamonds is to represent the couple’s past, present, and future. It is usual for the center stone to be slightly larger than the outer two. This makes sure that the center does not become overwhelmed by the other diamonds. Occasionally, contrast stones are present alongside the center diamond. This though is far less common than having three diamonds. By having three diamonds, the uplift in brilliance and sparkle can be quite something to see. Because the outer diamonds are also usually quite significant in their own right, this increases the amount of quality diamond on display. The modern round brilliant cut is the most popular cut for the center diamond. The outer diamonds needn’t necessarily be the same cut, however, and often employ other cuts to add a little contrast. Also, both bezel and prong settings are possible in a three-stone setting, which increases the options for stone and cut further. As one of the newer settings of the engagement ring world, the tension setting is fast gaining in popularity. Uniquely amongst ring settings, tension alone holds the diamond in place, hence the name. The band is split, and then slightly twisted to create opposing forces from the two open ends. These are then shaped to hold a particular diamond cut and size. The ends are pulled apart and the diamond is inserted. The inward force from each end of the open band then holds the diamond in place. It is actually a far more secure setting than it sounds. There is a very small risk of the diamond becoming loose if sufficient sudden force occurs on the ring, but instances are extremely rare. The tension setting, in fact, has proved to be as secure as any other, and more secure than most. Because of the need for thicker-than-average metal to provide sufficient tension, smaller carat stones can look somewhat lost. To get around this, fancy cuts are very popular in tension settings. Pear cuts are a good example of adding length to the appearance of a diamond and this helps with tension settings. With all sizes of diamonds, though, sparkle and brilliance become more obvious. You see more of the diamond in a tension setting than any other, and this is demonstrated with the amount of light reflection seen. Resizing is difficult, due to the nature of tension settings. Modern manufacturing techniques mean that a custom-made tension setting is often not as expensive as you might think. It is also an incredibly modern way to wear a diamond engagement ring. A cluster setting offers a lot of visible diamond. 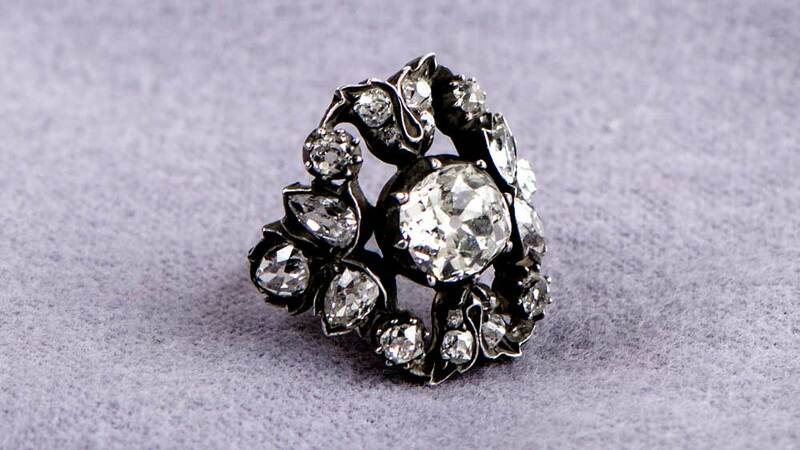 As the name suggests, it is a ring mounting that contains several diamonds in a tight cluster around the center stone. At first glance, the ring appears to have a single, large diamond. Only on further inspection does it become obvious that there are actually several diamonds in the setting. This means that the center stone needn’t be as large as might otherwise be the case. Many cluster settings go beyond the traditional shape of diamond engagement rings and take on any number of visible effects. Flower-like shapes are popular, as might be expected for a setting which was widely used in the are nouveau era. Because of the nature of cluster settings, the overall cost per carat of the diamonds is usually significantly less than a single diamond of the same weight. The smaller diamonds making up the cluster don’t require the same level of quality in terms of color and clarity as a single diamond would. This means a greatly reduced cost for a quite similar effect. Cleaning a cluster ring can be problematic. The sheer number of nooks and crannies for dirt and grease to lodge itself is very high. As a result, cleaning requires extreme care to avoid dislodging any of the diamonds. Better still, have a jewelry do the job for you. Vintage settings and their older brethren antique settings are more a type of decorative style than an actual physical setting type. 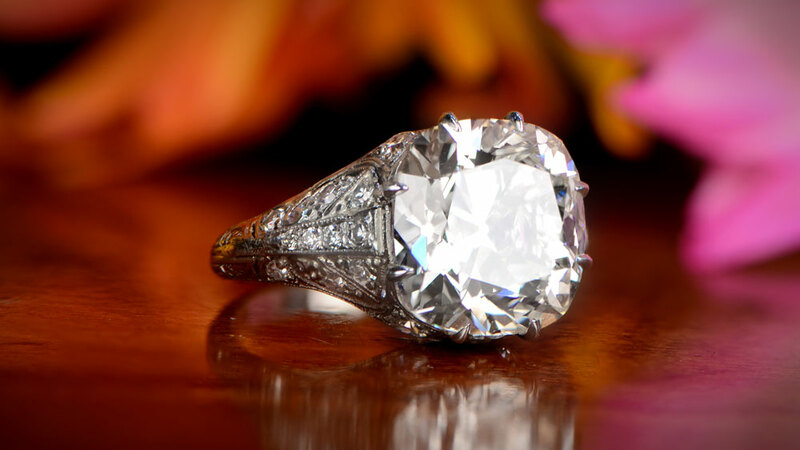 Mostly, the settings for vintage and antique engagement rings will be either prong or bezel. The differences come in the elements included in the design of the ring more than in the type of setting. 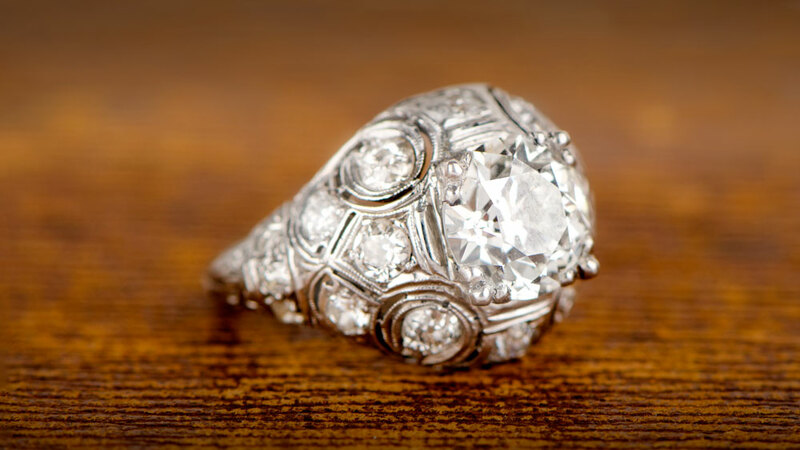 Vintage and antique engagement rings commonly include filigree and milgrain as part of the design. Filigree is a pattern of metalwork which can be used in various places on the ring. Normally, it is common to see it as part of the gallery underneath the center diamond. Milgrain is the addition of tiny beads of metal as decoration on virtually any part of the ring from the crown to the gallery to the band. The end result is always a stylish and elegant engagement ring. Vintage and antique rings, thanks to the unique styling and boundless charm created by their designer and maker, are a unique oasis in an industry which sometimes looks in danger of becoming too familiar in the modern designs we see every day. 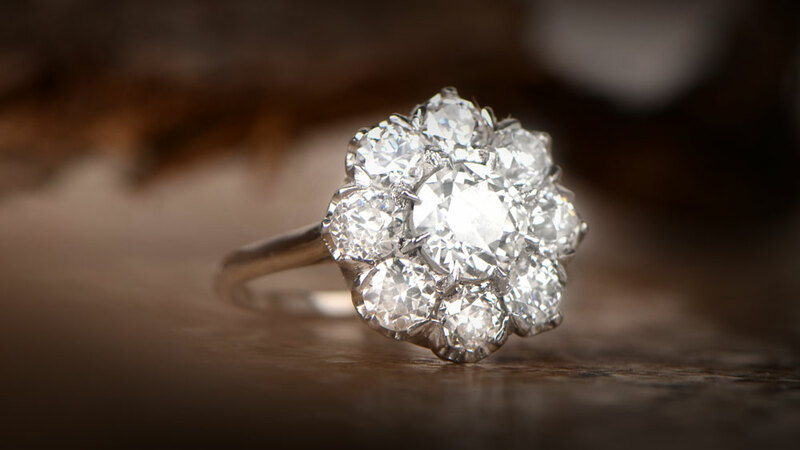 The handcrafted nature of vintage and antique engagement rings means that each and every one carries its own character and its own history. The split shank is a name used to describe a setting in which the band is divided (split) as it approaches the top of the ring. Although more popular today than at any previous time, the setting has been used on and off for many years. The design is especially effective with larger stones, as it removes the “thin legs” appearance which can sometimes occur when a large stone is atop a thin band. The split of the shank extends the appearance of width further down the ring than non-split shanks do not. It also gives the appearance of a larger level of support for the center stone and creates a bold expression. The two sides of the split often also contain small stones embedded. This adds considerable visual interest and provides designers with many options for the decorative look of the split shank setting. Crowns sit above a king and arch upwards. The crown mounting takes its name from the resemblance it has to the arches in a crown. Over time, the way the arches appear in the ring design has changed somewhat. However, the basic idea is still very popular and creates an elegant and timeless look. 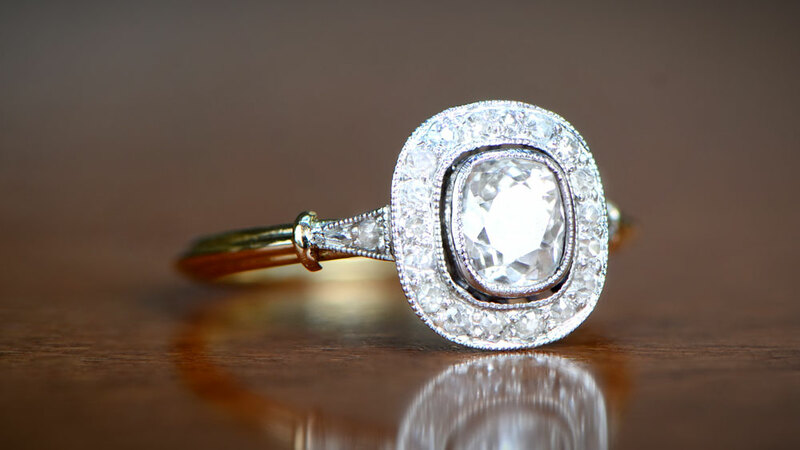 For most ring settings, the center stone usually sits in a mounting which forms part of the top section of the band. With a crown setting, it is markedly different. What you have is a complete band, with a separate setting on top. The setting is supported by shoulders which connect to the band, and this helps to create the cathedral arch effect. 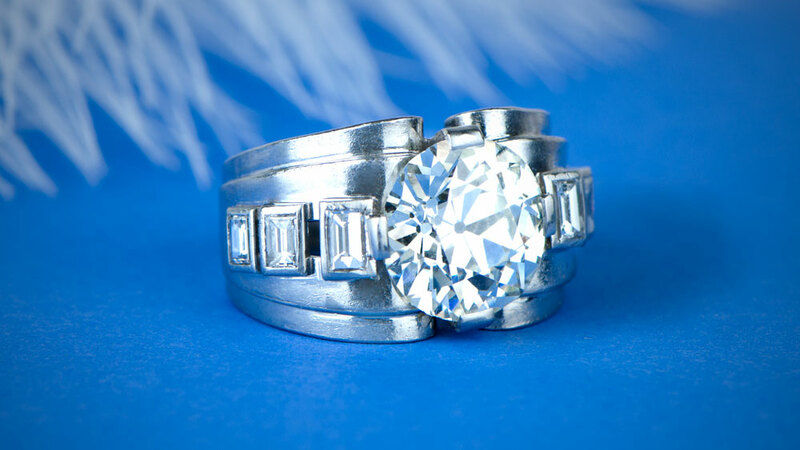 A crown setting can actually incorporate prongs, a bezel or one of several other setting types. Prongs are the most common way to hold the center diamond in place for most crown settings. The extra strength that the setting gives provides more security than a standard 4 prong setting. The diamond also sits very high, which allows for the inclusion of a gallery underneath. Crucially, the crown setting suits all cuts of diamond. The extra height of the setting, though, can create issues. It makes cleaning a little more complicated due to the many separate areas in which dirt can accumulate. The height also increases the chance of snagging on clothing. 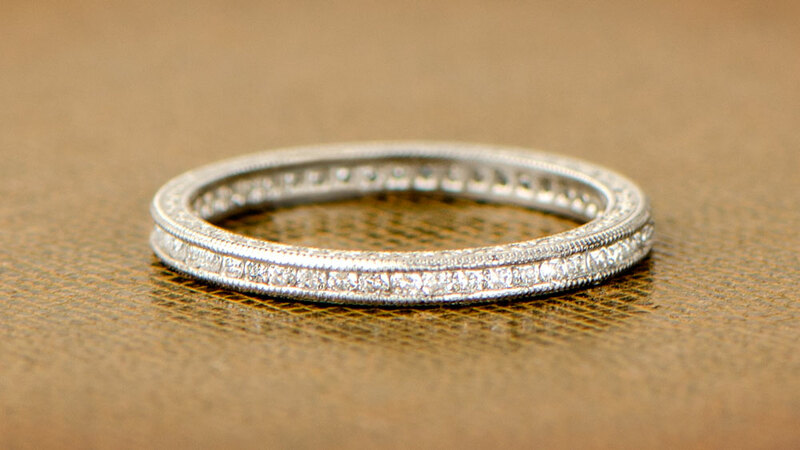 It’s not unusual to see rings that have small gemstones embedded into the band. A channel setting has a similar appearance but has differences in its construction. As the name suggests, a channel is cut into the band, and lined with thin metal strips. Small diamonds or other stones are then put into the channel. 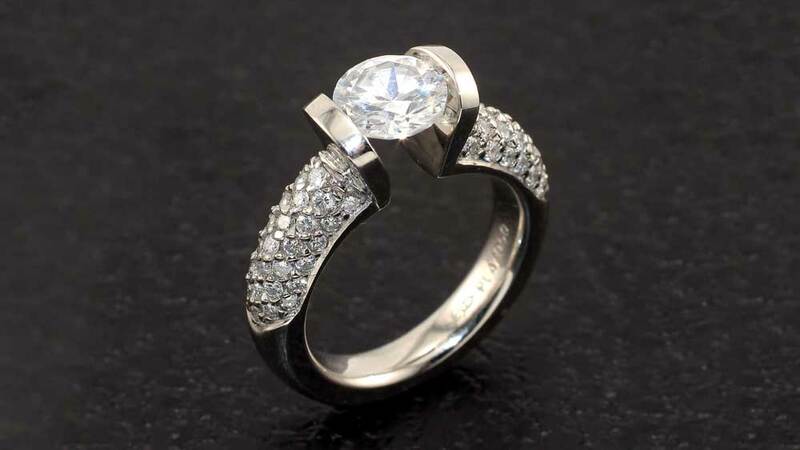 The setting is especially popular for rings which don’t use a center stone. This includes wedding bands, eternity rings or rings designed to stack. There’s no saying, though, that an engagement ring can’t have a channel setting just because it has a center diamond. Because the setting only occurs in the band, any ring can use it. The small size of the channel diamonds may lead to the assumption that they are at risk of being lost, but this isn’t so. It is actually one of the most secure ways to set small diamonds. The outer edges of the channel grip the stones very well, and the flush setting means no snagging. A channel setting is a very feminine, very delicate approach to ring design. 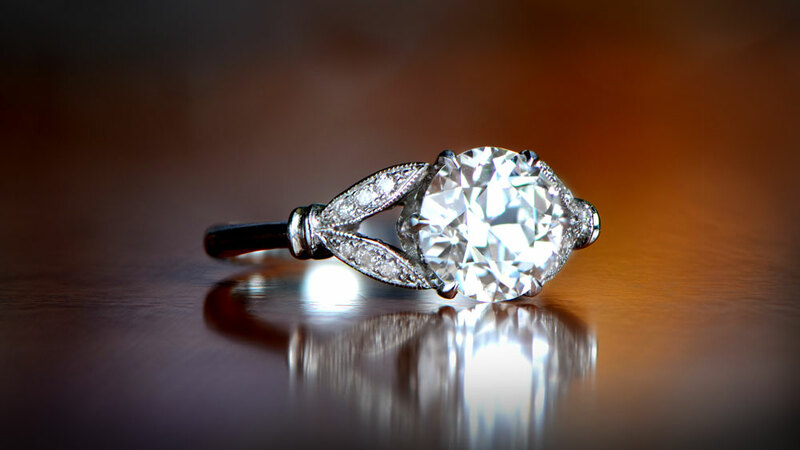 It can also allow for a slightly smaller center diamond, and yet still have a great visual impact. Click here to view an example of Micro Channel Band. Engagement ring designers spent decades convincing people that some diamond cuts could help to make their fingers look longer and more slender. And yet, one of the biggest trends in ring designs at the moment is the east-west setting. 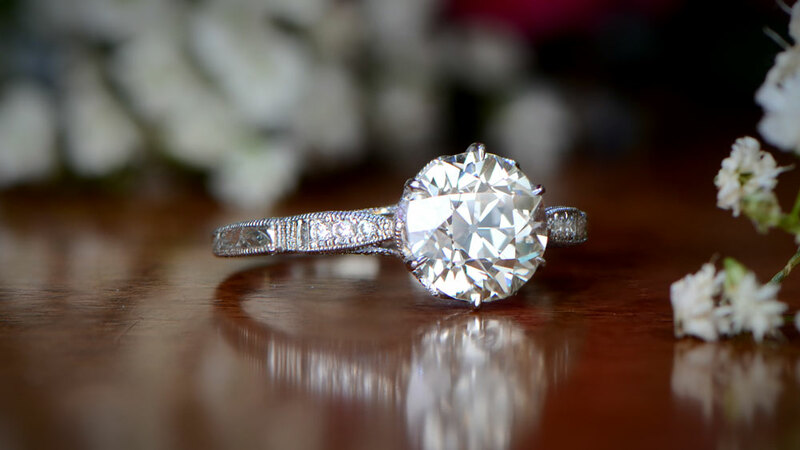 In case the name is new to you, it is the practice of setting a marquise or similar diamond perpendicular to its natural north-south alignment. An east-west setting only works with those cuts which have an uneven “length:width proportions”. As a result, round brilliant, cushion cuts etc will make no difference. However, marquise, oval, pear or even fancy cuts like hearts often make up the main stone in a east-west setting. It may sound like an odd idea, at first, but an east-west setting is different enough to be fresh and a little quirky. 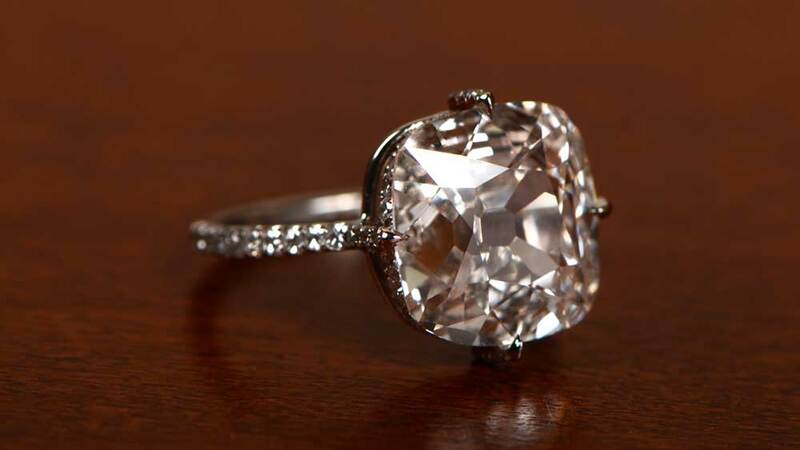 It has the added advantage of making the diamond look larger than its weight suggests. When placed north-south, unless the diamond is especially large, it will easily sit within the outer edges of the finger. Placed east-west it can reach and even exceed them. This makes it look “fatter” than it really is, and so larger as well. At present, although the trend is taking off, supply is still patchy. Consider having an east-west setting custom made to get the look you want. Usually, when we talk about contrasting tones in an engagement ring, it is because there are different color stones. Examples may be diamond/sapphire or diamond/emerald rings. However, a two-tone ring setting doesn’t mean having different colored gemstones, but two different colored metals. It doesn’t matter what style the design takes. Some two tone settings have a different metal for the inside of the band to the outside. Others may have a different metal used for the gallery. Some may even just have flashes of the different metal strategically placed. The freedom of a two-tone setting makes it a very eye-catching and appealing choice for an engagement ring, wedding band or another type of ring. A white metal almost always forms the basis of the design. This might be platinum or white gold. The contrasting metal is often yellow gold, particularly in vintage or antique rings. Increasingly, rose gold is becoming more popular. It is very “on-trend” at the moment and has the advantage of being much less expensive than high-quality yellow gold. The style is very nice and makes a clean break from traditional ring design. The art nouveau era came directly from the arts and crafts movement of the 19th century. An essential part of art nouveau is the recreation of natural motifs, sometimes in a very literal sense. As a subsection of this is we have organic motif settings for engagement rings. These rings are very bold in design and content and aim to recreate flowers, leaves and other similar objects in the finished piece. 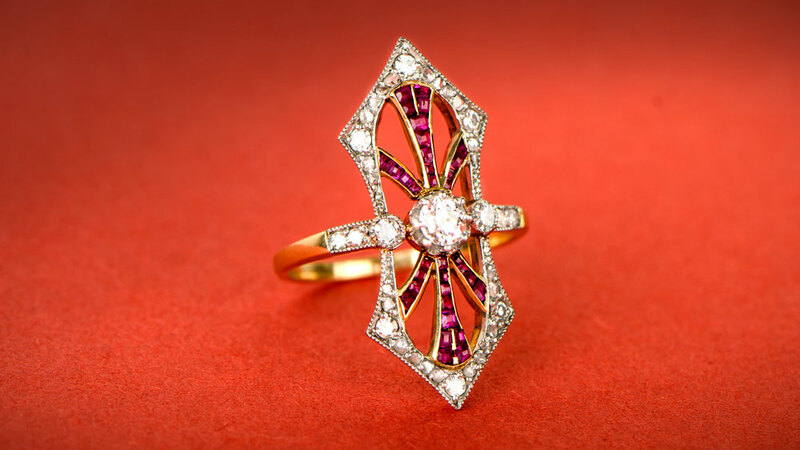 Diamonds and other gemstones in floral arrangements is a particularly popular approach for ring designers of the vintage and antique periods. Occasionally, there may be different metals in the band and the setting, with the contrast metal providing the outline of leaves of petals. Organic motif settings will usually contain a larger center diamond as the center of the flower, with smaller diamonds forming the petals. The setting is by design, quite a large one. An organic motif setting is very creative and this produces often elaborate layouts for the actual stone placement. Many organic motif settings cam with vintage and antique rings, in line with when art nouveau was at its peak. It is a lovely way to wear an engagement ring and sure to draw attention. Dome settings are quite different from other styles. Many settings have a distinct band and head, but dome settings make the two into one. The head of the ring becomes an extension of the band, with a deep and wide gallery ending in a rounded top, hence the name. The gallery usually has small diamonds or other stones. These, themselves, may be channel, halo or even pavé set around the usually quite large center diamond. There will often also be milgrain, but filigree is limited as the size of the head needs to have pretty substantial support. A dome setting is often accused of lacking the femininity of some other settings. But this is to deny the fact that it is a fantastic way to wear a ring which expresses its own personality as well as that of the wearer. The number of diamonds in a dome setting can mean that the best examples are expensive. However, because the small diamonds used on the shoulders and gallery don’t need to have the brilliance of the center diamond, there isn’t the same need for high-end, high price stones. 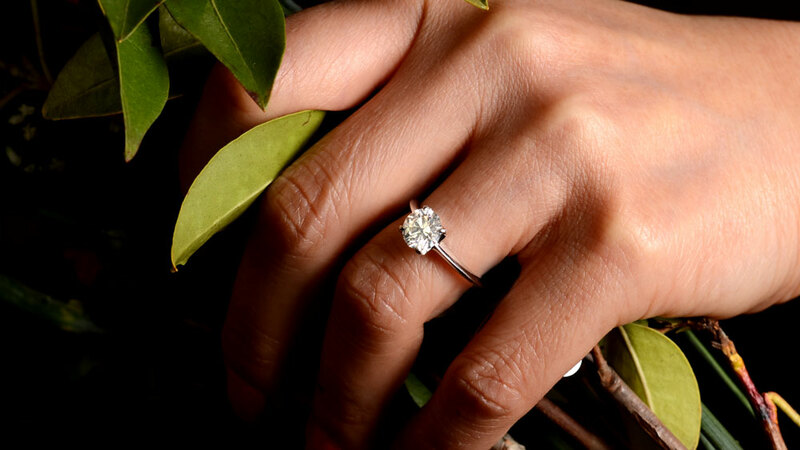 We commonly see marquise and oval diamonds used in north-south settings to lengthen and slim the fingers. The elongated setting has a similar intent but, instead of a single stone, designs are much more involved, and several stones will be used. At times, contrasting stones may add emphasis to the design. Because an elongated setting already has a larger than average footprint, the need for a large center diamond diminishes. The extra length of the design, and the additional stones help to create the appearance of a ring with more carats than it really has. As a result, elongated setting rings can be surprisingly affordable due to the less expensive diamonds or other gemstones in them. Open designs are common for elongated settings, but they tend to be quite shallow to try to minimize the weight of such a long ring. They may also have an open gallery to add some interest to the ring when viewed from the side. Although an unusual choice for an engagement ring, an elongated setting is a wonderful approach to ring design. It’s both bold and feminine at the same time and has tons of appeal to suit all tastes. A retro setting is big. It’s also bold. It’s also deceptively simple in its design and construction. Retro settings aren’t subtle, but nor are they ever intended to be. But they do have bags of personality and a presence which is hard to match with any other type of setting. There are certain things you come across in life which feel tough enough to be thrown at a wall and the wall would come off worst. That’s the impression you get with a retro setting ring. The bands are usually much thicker than on modern designs, and there’s a deliberate lack of intricacy in any element of it. 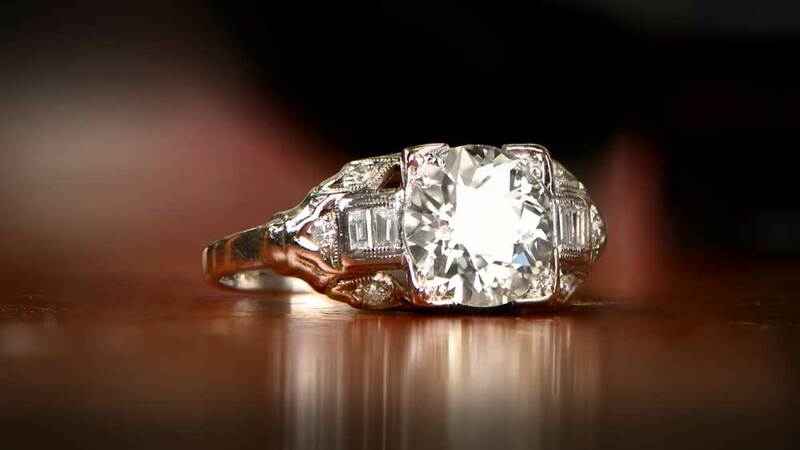 The idea of a retro setting, as might be expected, is to recreate the styles from the history of engagement rings. As a result, a large center diamond is usually present. Accent stones usually appear on the shoulders instead of right against the center stone. You will rarely find halos, pavés or other embellishments in a retro setting. The setting you choose should not only be something you like, but something which likes you. By this, we mean that not all setting types suit all fingers or hands. Some can make fingers look longer, and some look shorter. Some will simply be too large for the hand size, and some too small. If you can, get a second opinion on your chosen setting from someone without a vested interest. You may also find that some rings have more than one element of the settings listed above. Filigree and milgrain can turn up in many settings, as can halos or pavé stones. A solitaire diamond engagement ring can have a prong or bezel setting and yet still be uniquely solitaire. When all is said and done, ring design is a varied and quite loosely structured process. If your budget is not a large one, then don’t despair. Look for a setting which can make smaller diamond appear larger but which do not add greatly to the cost. Consider different metals with different stones, if necessary. Diamonds with a faint hint of yellow look stunning in yellow gold, for example. The choice of settings available today is wider than at any time in history. And so you would be unlucky not to find one to suit your finger and your budget. The beauty of 21st-century life is that shopping around had never been so easy. Use that fact to your advantage and enjoy your chosen engagement ring for the rest of your life.